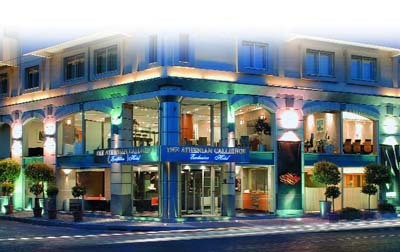 Conveniently located the heart of the downtown financial district of Athens, the Athenian Callirhoe is a unique Boutique Hotel, an inviting retreat for any lifestyle. It offers impeccable service, outstanding amenities, and accessibility to all the cultural landmarks of the Greek capital, an easy walk from the city’s main Syntagma Square, the Acropolis, Plaka (city’s old quarter), the New Acropolis Museum and the Kalimarmaro Stadium where the first modern Olympics were held. 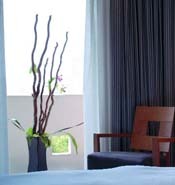 Guests can relax in one of the hotel’s spacious guestrooms, designed to ensure comfort. The guestrooms are appointed with modern amenities including, individually controlled heat or air conditioning, electronic lock, private bathroom with full amenities, hairdryer, magnifying mirror, complimentary coffee/tea facilities, mini bar, direct dial phone, flat screen TV system, voice mail, Satellite and TV video, alarm clock ADSL high-speed Internet, sage, daily maid service, balcony, Jacuzzi, bathrobe and sleepers (Executive and Junior Suite). At the stunning rooftop deck showcasing a breathtaking view of Athens’ skyline, the Callirhoe Restaurant serves an extensive menu of Mediterranean cuisine prepared by the hotel’s expert chef, ideal for business dinners or romantic evenings for just two. Guests can relax with coffee and snacks at Callirhoe Café; the Café Degli Artisti features original Italian delicacies and a variety of Italian and Greek wines. The hotel’s facilities include laundry-ironing-dry cleaning, free wireless Internet in public areas, business services, babysitting, doctor, hair dresser & masseur on call, car rental, limo service, concierge, theater bookings, florists, flight confirmations and handling. The hotel features four exclusively furnished and equipped meeting rooms with maximum capacity up to 120 pax, capable of accommodating any type of business or social event. The conference area is designed with the highest standards of security and comfort.